Jon was born in Michigan but grew up for most of his life in Waynesboro, VA. He was raised in church but didn't commit his life to Jesus until he was 16 years old. Jennie grew up in the small town of Afton, Virginia, the only child of her parents. They weren't a church-going family until Jennie was 13; God gave her a revelation of the destructive state of her life and she asked her parents if they could start attending church together. Within a few months Jennie had given her life to Jesus. Jon and Jennie attended the same church and youth group, building a very strong friendship. God faithfully provided mentors through the years to disciple and speak into their lives. Jon took his first mission trip at the age of 17, spending a summer in Costa Rica with Teen Mania Ministries. Jennie was intrigued by the awesome stories Jon came home with and decided to join Teen Mania herself the following summer in Honduras at age 15. It was in Honduras in the summer of 1991 that Jennie knew she had a life long call to missions. Jon and Jennie both spent the following summer on a medical and dental outreach to Honduras with their church. Jennie spent the following summer in Botswana and Zimbabwe, again with Teen Mania ministries. Jon had graduated in 1990 and now worked as full time worship leader at his church. Jennie graduated in 1992 and was attending college and working at a local nursing home while trying to figure out God's plan to get herself onto the mission field full time. Then something crazy happened. They fell in love. Jon and Jennie wasted no time and were married in November 1993. Best decision ever! A year later they did their DTS at Kings Mansion in Kona, HI. After a few years of sorting out some significant medical issues, Jon and Jennie returned to YWAM as full time staff in 1998, in Weston, Colorado. They primarily staffed and lead DTS's and soon became the DTS directors, leading outreach teams to countries within Central America, Africa, and Central Asia. After 8 years in Colorado, the small YWAM base closed and Jon and Jennie were invited to join staff at YWAM Lakeside, MT, pioneering the DTS Equip leadership school while staffing and leading DTS's. During their 7 years in Montana, Jon also served as the personnel director for two years and completed the SBS and Titus schools, Jennie served in women's ministry, and both were trained in debriefing. Along the way the Justine family grew, and grew, and grew! They are happily raising a tribe of four awesome men. 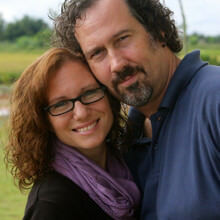 While staffing DTS in Montana, Jon and Jennie took outreach teams to Thailand and Cambodia. It was on one such DTS outreach to Thailand in 2009 that they felt God calling them long term to northern Thailand. It had long been their dream to move overseas to host and coordinate outreach teams. They saw opportunity and need for this in northern Thailand and began making plans to move their family to Chiang Rai. In the summer of 2013 that dream became a reality and the Justine family joined YWAM Thailand. Wahoo! We are stoked to be a part of what God is doing in this nation, excited to build bridges between teams and long-term ministries, and seeing the kingdom of God advanced in northern Thailand. We look forward to seeing you in the north!